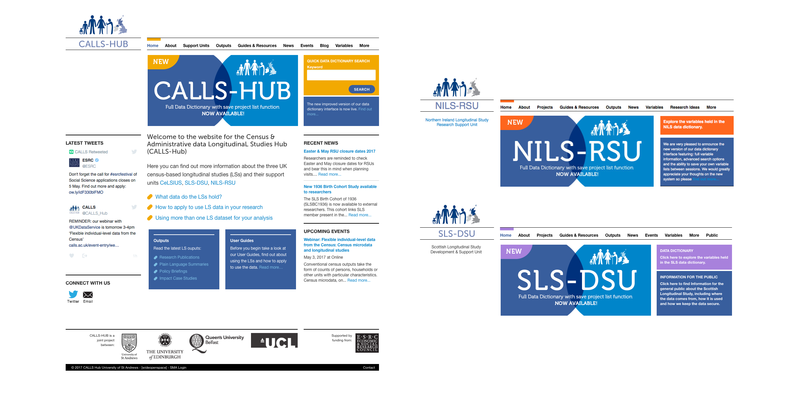 CALLS-HUB is a collaboration between the University of St Andrews, University of Edinburgh, and University College London, to harmonise and promote the work of the three Longitudinal Study Research Support Units (CeLSIUS, SLS-DSU, NILS-RSU). A central purpose of the CALLS site is as a UK census data research tool. Prior to CALLS researchers would search on separate regional census databases, each of which presented data differently. The CALLS Data Dictionary presents a harmonised view of all UK census data. To achieve this Wideopenspace developed a new database and system to readily import and convert regional census data references to a unified structure. This allows users to easily and reliably compare and contrast UK wide census data in a way that was previously not possible. In addition to the CALLS project we also developed the regional Scottish Longitudinal Studies website along with providing HTML templates to Queens University Belfast for the Northern Ireland Longitudinal Studies site. Users can also search on the full CALLS data dictionary via each of the regional sites.